A new space race is on amongcommercial companies hoping tosnag a lucrative contract to ferry astronauts to the InternationalSpaceStation. After NASA's space shuttles retirenext year, astronautswill be left without an American-built means of transportation tospace. The newNASA authorization bill passed earlier this month authorizesthe spaceagency to hire space vehicles through the private sector for thispurpose assoon as they're available. This spacecraft under development byLockheed Martin wasoriginally designed to carry crews to the space station and the moonunderNASA's Constellation program, which has since been canceled. Themoon-orientedConstellation program has been replaced with a new space plan aimed atsendingastronauts to an asteroid by 2025. But plans for the Orioncapsule were revived under the new NASA vision as anemergency lifeboat thatastronauts could ride home if they needed to escape from theInternationalSpace Station. Lockheed is hoping to develop thecraft further to carrycrews up to space, as well as down. "We're well along in thedevelopment," saidKenneth Reightler, vice president of NASA program integration atLockheed. Thevehicle has already passed its phase 1 safety review, and some systemshaveeven gone through the next step, called critical design review. Because Orion was originally designedto go to the moon, ithas met the stringent standards for deepspace exploration, which are more than will be required fortransportationto low-Earth orbit and the International Space Station, he said. "What you're left with is anincredibly capablespacecraft for LEO," Reightler said. SpaceExploration Technologies hasdesigned not only its own gumdrop-shaped space capsule, but a rocket tofly iton. The company's Falcon 9 booster launched successfully on its firstflight test in June2010. The Dragon capsule,designed to carry either crew or cargo to low-Earth orbit, is due tomake itsdebut spaceflight on the Falcon 9 as early as next month. SpaceXalready has a $1.6billion contract with NASA to haul cargo to the International SpaceStationaboard Dragon, and it's a leading contender for the coveted duty ofcarryingcrew there as well. "SpaceX's mission is to provide thesafest, mosteconomical and reliable transport to low-Earth orbit," said former NASAastronaut KenBowersox, SpaceX's vice presidentof astronaut safety and mission assurance. SpaceX estimates that it will takeabout 2 1/2 years toconvert Dragon from its cargo configuration to a spacecraft ready tolaunch withpeople aboard. The main hurdle will be designing a launch escapesystem,Bowersox said. "A lot of people think that's a veryaggressivetimeline," he added. "SpaceX likes aggressive timelines." 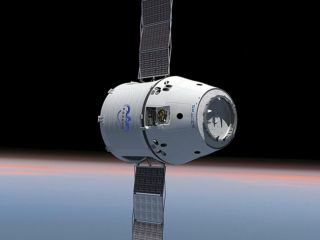 Tickets aboard a Dragon flight shouldcost about $20million, with the total price of a launch coming in around $140 millionto $150million, Bowersox said. For comparison, the most recent spacetourist flight to theInternational Space Station on Russian Soyuz spacecraft, arranged bytheVirginia-based firm Space Adventures, carried a cost of about $35million. This entry from Boeing into thecommercial spacetransportation fray is a capsule larger than NASA's Apollo spacecraftbutsmaller than Orion. "We've kept it very, very simple,"said KeithReiley, Boeing's program manager for commercial crew development andspaceexploration. Called the Crew Space Transportation100, or CST-100, thecapsule could potentially launch aboard a ULA Atlas 5 or Delta 4rocket, oreven one of SpaceX's Falcon 9s. It would likely lift off from NewMexico'sWhite Sands Missile Range, with Edwards Air Force Base in California asabackup site. The price per seat on the CST-100space capsule is not yet determined, but it will depend onhow often thevehicle can fly. "It's all about flight rate," Reileysaid. "The fact that NASA provides funding to help support development ?that?sa very big deal. The more flights you fly, the cheaper it will get." Boeing received $18 million from NASAin February 2010 todevelop the spacecraft underan existing commercial crew development competition. This space plane design underdevelopment by the Sierra NevadaCorporation in Centennial, Colo., is expected to flyatop a United Launch Alliance Atlas 5 rocket, which is an expendablelaunchvehicle. The spaceship will carry up to seven people to theInternational SpaceStation, and could even be adapted to carry cargo or to servicesatellites inspace. Dream Chaser also won money from NASAin the February2010 contest ? Sierra Nevada was the top winner, taking home$20 million. "Wecall it the DreamChaser because I like chasing dreams," said Mark Sirangelo, corporatevicepresident and chairman of Sierra Nevada Space Systems. Thecraft stands apart from most othercompetitor designs in that it is not a capsule like the Soyuz andApollospacecraft, or like the Orion, Dragon or CST-100 vehicles. "Weat Sierra Nevada aredoing something a little bit different," Sirangelo said.